A few years ago I bought a commuter bike specifically to be a winter beater. It's not one for speed, or comfort and the best thing that can be said about it is that it's functional. So functional that I ride it every day. To the market, to yoga, the beach, the packy and any other trip that needs to be made around town. Things like the daily trip to the library or the two or three times a week ride to the docks for rowing. A recent addition is the super market grocery bag to go along with a regular touring pannier on the other side, a handlebar bag and a trunk bag. It carries not only groceries and 6 packs but yoga mats and blocks, a rowing seat and beach chairs. The big stuff like the mat and beach chair get bungeed on the rear rack. I do keep track of my miles on the web site bikejournal.com. It was for commuting, touring and the occasional road ride. Now it's all road ride and the new category, Marin Miles. This week "the Marin" and I logged 56 miles doing stuff around town that I used to do by car. Add a couple of 40 mile road rides to end up with a pretty good week of riding. I've seen them logged as "Utility Miles", but you have far more than I ever did. Are you dropping any weight by riding more regularly? You are getting some great miles in, and both fun and practical ones, at that. 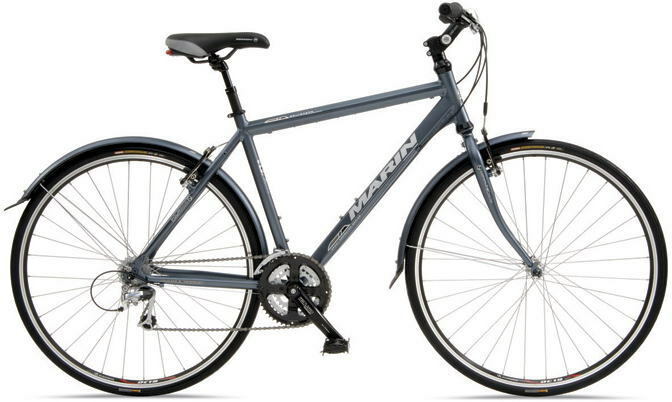 The Marin looks like a very practical bike. I imagine your touring bike would also be excellent for running errands. Doc: I have lost 15 lbs since retiring on June 20th.